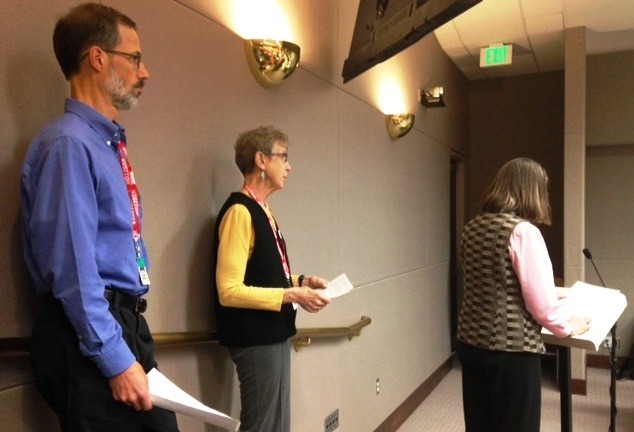 Five OTOC leaders testified at the Nov 12 meeting of the OPPD. Mary Spurgeon and Tim Fickenscher of First Methodist, Mary Bamesbuger of the Environmental Action Team, Mark Loscutoff of First Unitarian and Mary Ruth Stegman of St. John Creighton represented OTOC in challenging OPPD to reconsider their plan to increase their fixed charges from $10.15 to $35 and at the same time they reduce their rates by 28%. OTOC leaders waiting to testify to OPPD Board. Five OTOC leaders made OTOC’s concerns known to the Board. According to Mary Spurgeon, the 1/3 of OPPD households which use relatively little electricity each month (200 to 700 kwh/mo) would spend about$50 to $225 more each year for their electricity. These 108,000 households would pay an extra $12 Million per year for the same amount of electricity. The 40% of OPPD households using a lot more electricity (1000 to 2000 kwh/mo) would spend $50 to $345 less each year. These 130,000 households would pay $19 Million less each year for using the same amount of electricity. Mary Ruth Stegman called this proposed restructuring a “ radical proposal. It is a radical change in the sense that you are attempting to make a fundamental, deep rooted and long lasting change in how we pay for electricity. 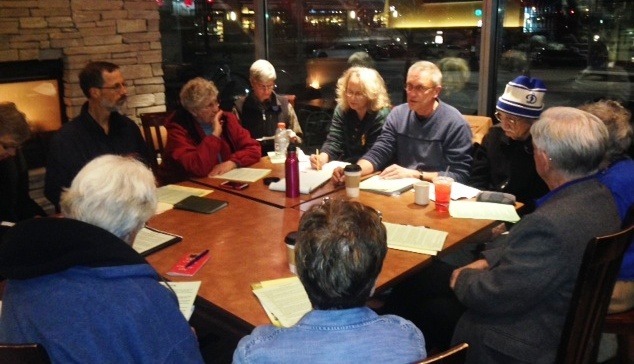 ” Mary Ruth challenged OPPD to have more community meetings to explain and justify such a change before taking action. Mary Bamesbuger testified how she has struggled since her retirement to reduce her electric usage from about 800 kwh/mo in August, 2012 to 400kwh/mo in August, 2015. She made many changes to reduce electric usage and purchased energy efficient appliances in order to live on her fixed income from Social Security. Mary’s bill would increase by $155 per year for the same energy use under the proposed plan. Thirty eight OTOC and community members met with OPPD staff and Director John Green on Monday, November 9 at 6 pm at First United Methodist Church. OTOC and community leaders listened to OPPD’s presentation and asked questions and raised concerns about OPPD’s current proposal to restructure their service charges and electric usage rates and also ask for a separate 4% increase to electric use rates in 2016. Numerous OTOC leaders have met with OPPD staff during their recent open houses and have submitted questions to OPPD. The OPPD staff provided answers to those questions and the data OTOC leaders requested. The staff’s answers did not alleviate OTOC’s concerns about the impact of the proposed restructuring of services charges and rates.